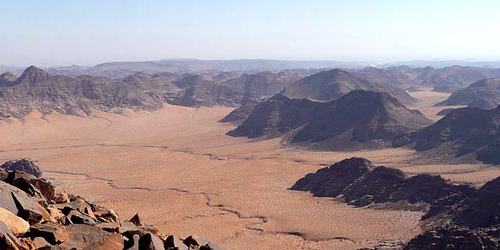 If you are looking for more than one day or two days in Wadi Rum here are a number of possibilities that can be added on to any of the other trips. See also below for two day programs. 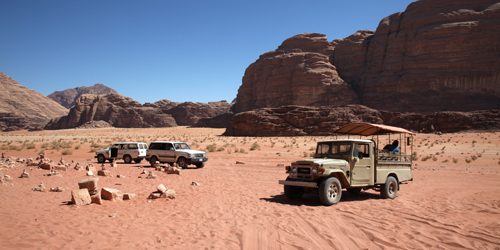 We start off with the classic jeep tour as given in the page "A day with the Bedouin". The next day we drive to Jebel Khasch. We come down in the distant valley of Nogara where the jeep will be waiting for us. After a night in the desert we start off on the camels for a 4 to 5 hours trip. This is a program with something for everybody who loves the wild places and the desert. Price: 175 JD/person for 3 days for 2-4 people. This includes all meals, equipment for sleeping, overnight stays, the camels and the guide with his own camel. Price: 190 JD/person for 3 days for 2-4 people. This includes the guide, the camels, the overnight stay, sleeping equipment and all meals. This is an exciting 3 day/2 night program, taking you far to the south away from Rum Village and into the valleys close to the frontier of Saudi Arabia. It is an adventure program and you will sleep in the desert under the stars, each night at a different place, far away from any camp. Day One: Classic jeep tour "A day with the Bedouin". We'll visit further the bridge on Jebel Burdah and then to Um Fruth Bridge and Khazali Canyon. Day Two: Far away from the village and the usual tourist tracks we reach the lonely Wadi Saabit. We'll see Wadi Noghra and Jebel Sweibit. Day Three: Drive through one of the great climbing areas of Wadi Rum where some of the most experienced climbers come regularly. Price: 240 JD/person for 3 days for 2-3 people, 210 JD/person for 3 days for 4 people or more. This includes the guide, overnight stays, all meals, the guide and car. For this trip we take you on a general tour of the main sites of Wadi Rum, starting off with the more usual places and after the first 2 days heading south and away from the general tourist area. Each day on the camels we go out in a different direction away from the desert camp, where normally we bring you each night to sleep. 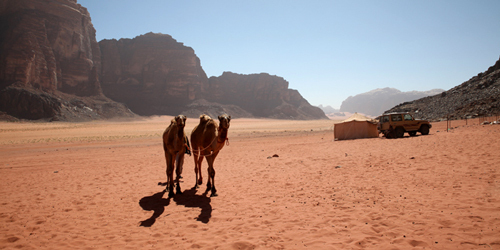 This camp is located 12 kms from the village of Wadi Rum. This program finishes around 4 pm on the last day when we return to the village. Price: 295 JD/person for 5 days for 2-4 people. 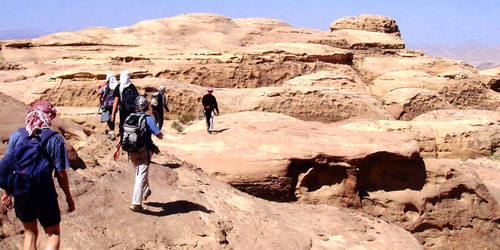 This price includes everything, the guide, the overnight stays, the camels and all meals. Easy hiking and riding tour with no difficulties involved. We vary simple walking with trips in a jeep. You'll see the Makharas Canyon, Um Ishrin, Barragh Canyon, Jebel Burdah, Jebel Khasch, Wadi Nachra Canyon, Jebel Abu Hamata and Jebel Qatar. Expect around 3-4 hours hiking and walking each day. Price: 350 JD/person for 5 days for 2-4 people. This price includes everything, the guide, overnight stays and all meals. This trek takes you to the south eastern valleys which are largely uninhabited. This is the area that T. E. Lawrence passed through on his dash to cut the railway line at Mudawarra. We take this trek more sedately and don't go as far as Lawrence did. You would be alone with the guide and a jeep meeting you at midday and in the evening with food and water. The longer trek allows you to become fully used to riding a camel. 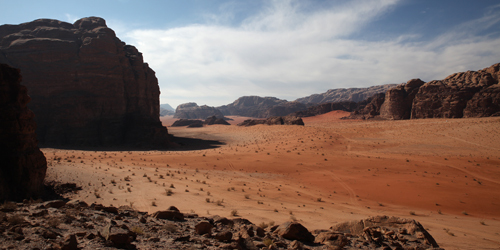 If you are looking for less than three days in Wadi Rum there are a number of possibilities. Look as well for our one day trips and two day programs. You can find our general information about our tours here.